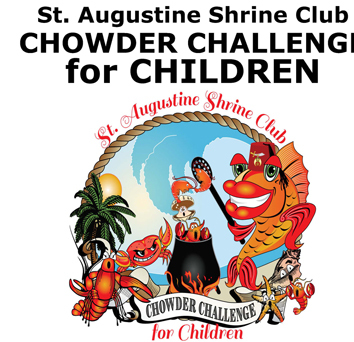 SAINT AUGUSTINE – The people chowered down, and then they spoke Feb. 25, when the St. Augustine Shrine Club hosted its Chowder Challenge for Children at the St. Augustine Amphitheatre. “We had a great turnout and both the public and the restaurants were very pleased with the flow of traffic and the comfortable setting,” reports Jerod Meeks, who chaired the Shrine event. When the people spoke, they chose Kyle’s Seafood for the People’s Choice Award. Minorcan Conch Chowder: Hurricane Patty’s – first; Kyle’s Seafood – second; Purple Olive – third. Minorcan Clam: Aunt Kate’s – first; Sunset Grille – second; O’Steen’s – third. New England Clam: Sunset Grille – first; Prohibition Kitchen – second; Purple Olive – third. Seafood: The Reef – first; Sunset Grille – second; Kyle’s Seafood – third. Special thanks to Hurricane Patty’s, Kyle’s Seafood, Purple Olive and Sunset Grille, who participated in all categories. Proceeds from the Shrine event support the Shriners’ Crippled Children’s Hospitals.